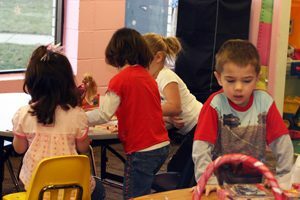 Pre-Kindergarten classes introduce four and five year olds to a structured school setting. Students play cooperatively, learn to speak in front of others, and take turns sharing in both small and large group settings. Each student learns handwriting, pre-reading (letter recognition & pre-phonics), and early math skills (counting, & pattern recognition). Age appropriate Bible teachings are integrated into daily lessons.